Mahashivaratri is on the most popular festivals of Hindus in Kashmir, especially that of Kashmiri Pandits. In Jammu and Kashmir, Shivratri is known as Hayrath or Herath. And the most important day of the festival is the 13th day of the dark half of Phalgun month. A day ahead of the normal Shivratri day in other parts of India. To Kashmiris, Maha Shivratri signifies Lord Shiva's wedding with Parvathi. Herath festival 2019 begins on the first day of Phalgun Krishna Paksha (February 20, 2019) and ends on the Amavasya day in Phalgun (March 6, 2019). In between there are numerous auspicious days like Hur Ashtami (February 27, 2019). The main rituals of Herath festival begins in 2019 on February 27. Wager Bah ( February 28, 2019). The important pujas are held on the Shivratri day (Shiv Chaturdashi) (March 4, 2019). The pujas culminate on the Amavasya day which is known as Doonya Amavasya ( March 6, 2019). most important days are Thrathshi, Choutash, Amavas and Parva. The first two weeks are meant for preparing for Shivratri. House and surroundings are thoroughly cleaned and the puja requires several items especially numerous earthen pots. 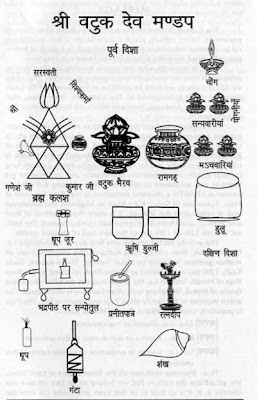 Before starting the puja on the main day (two days before Amavasya), several earthen pots (even steel or brass) representing Shiva, Parvati, Ganesha and other gods in Hindu pantheon are neatly placed in the puja room. Two big pots represent Shiva and Parvati and small pots represent other deities and Shiva’s attendants. The pots are filled with walnuts and decorated with flowers. These pitchers are known as Vatuk and Shivratri puja is also known as Vatuk puja in Kashmir. The worship begins with special prayers to Lord Ganesha. Sani Putul – a cone shaped clay figure – is worshipped as Brahman. Sani Putul is an attempt to represent the formless. Then Shiva and Parvati are worshipped and there is singing of hymns and Arati. On the main day, people visit temples and spend time in worshipping. Many people also observe Vrat or Upvaas or strict fast. The next is meant for celebration and feasting. Shivratri is observed by Kashmiri Pundits in a similar way as Hindus in other parts of India observe Ganesh Chaturthi, Durga Puja and Pongal. There several regional variations in the way in which night of Shiva is observed by Kashmiri people.